As a special Halloween treat to my 3 loyal readers, I thought I'd introduce you to a new "Game on the Cheap" known as "One Against the Dead." Yes, it is a zombie game. Zombies for some reason have become a rather popular theme of late in the pantheon of board game geekery. I'd go about and list them all, but Yehuda went ahead and created a nice list for Halloween that includes not only zombies, but all of your typical Monster Mash characters and genres. 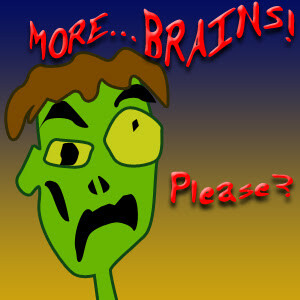 Anyway, with the mad rush towards zombie-ness, I thought it would be fun to see what I could come up with. Most zombie games, from what I can tell, seem to really try and be a zombie movie for some reason. This happens almost to the extent of moderately role-playing, giving player various archetypal abilities, and various goals and such. Additionally, it appears, that usually one player controls the zombies while the others play the heroes; this doesn't seem to make much sense to me. I mean, what kind of artificial intelligence does a zombie need that you can't just program them into the game. It's not like zombies do some clever velociraptor-from-Jurassic-Park pack hunt strategies or something. Zombies are slower than the living. Zombies go after the closest living brain. And there are a lot of them. That's all you need! Anyway, "One Against the Dead" is, as the name suggests, a solitaire game. And being that it is a game on the cheap, it doesn't have much fluff in terms of scenarios, characters, special abilities, etc. The winning conditions are simple, get to point B from point A. It features a fairly unique "health" system, in that doesn't record what typically would be referred to as "taking damage." In most zombie movies, if you have just been nibbled on a bit, that's usually pretty bad news, as you become infected anyway. Having a health score doesn't make much sense in zombie-town, as getting damaged just sort of means that you are putting off the inevitable transformation anyway. So, instead, we have "strength," which sounds pretty much like the same thing, but it's not. Conceptually, this represents how much will power and energy you have to fight off the dead. As long as you can keep your strength up over the amount of zombies that are attacking you, you are still in the fighting. But once the zombies out-number your strength, you become overwhelmed and cannot resist anymore. This has a weird little psychological implication. Whereas simply having something drain your life points down to zero, at least you feel like you put up a grand struggle, and went down fighting, ala a crazed Spartan warrior. Being overwhelmed is different. Sure you might have 7 strength left, but when surrounded by 12 zombies, you are forced to give up. It's a surrender, not a glorious fight-to-the-death story told for the ages. You are just another drowned body who gave up against the rising tide. And trust me on this, I've been quite surprised at how fast the tide can rise in this game. This in no "oh, look, two zombies are at the door breaking in waiting for a glorious headshot" game. Most of the time, this is a desperate run against a tidal wave, with a lot of crossed fingers as to what cards you draw next. And while the game is fairly random, it does have some amount of decision making with regards to building the zombie-infested town. This is important, however, as the amount of zombies that become active is a direct result of your card placement when building the town. And while it is by no means a deep game, there are some tactical implications to it: "Do I place this card here, which creates 1 zombie, in the hopes that the next card I draw isn't a worse fit that creates 3 zombies." The weapons may still be a little bit too powerful, and it may still be too easy to escape to the awaiting helicopter. But I think it's an amusing 15 minute ride nonentheless. As a side note, if you truly are playing with coins, you will need quite a few of them. Buying a bag of plastic play coins might be a better idea, just make sure that the coins have apparent heads and tails sides to them. Just click here to go to the Games on the Cheap page. One Against the Dead is on the bottom. Sir Reginald was officially emailed off to Hippodice last week. I hope he didn't get hurt when he was getting compressed. We'll have to see what happens this year, as my entry last never apparently never quite made it through the internet for some reason. For those who would like to build a copy of the current game and rules, here a link to where you can download all of the required files. Anyway, the first game we played was Xaqery's Nobleman (version 7.0! ), which turned out to be pretty fun. I have had it described to me on a few occasions, which made my head swim. And the swimmingness in the head re-appeared again upon the overview of the rules again. There is a lot of stuff going on, as a player can have a potential of performing nine (if I counted right) different actions on a given turn, each with their own different rules. In addition, some are "shared" actions in that everyone takes the action in turn, but with the players who goes first getting a bonus while players at the end will have limited (or no) options (much like the shipping rules in Puerto Rico). Other actions are solo and just occur to the player picking them. There are cards, there are land tiles, there are buildings, there is money, there are knights; it's a pretty big game. But in the end, it all sort of make sense. Nothing felt really broken. But as in anything this big, there are some balancing issues that need to addressed. And most of this was discussed after the game. Various suggestions included a slightly better use for the knights which will let a player leech a little bit on to another player when they perform a "Taxation" event, and not dragging low prestige losers along with victory points when a "Masquerade" is called. Afterward, I was given the "new guy treatment" by letting Sir Reginald take the table. Which turned out to be a complete reversal of what had happened during Nobleman. In Nobleman, especially towards the end of the game, there was a lot of discussion regarding best ways to score points, balancing, etc. Sir Reginald turned into something different altogether; a fast paced wacky race to build things, pretty much disregarding any thought towards effectively trying to win. There was little concern for most of the game for trying to match up Desires. It turns out, and rightly so, that setting up 10 "rules of scoring points" at the beginning of the game is pretty useless, especially since those rules can be changed by the players. First of all, reading, and learning ten different ways to score at the start of the game is daunting, and not much fun, and cast a shadow on the fun part of the game, which is getting into playing with Cubes as fast as possible. I pretty much feared that this was the case, and now seeing it action, it is confirmed. Secondly, the correct way to play, in this case, was to look at the cards in your hand, and build according to them, and then, near the end of the game, try your best to swap them out on to the scoring board. Which created a set of scoring rules that were pretty much random to everyone involved. And so, with everyone pretty much agreed that the actual building of things is fun, and that starting the game with 10 target rules was way too much. Starting the game with only 1 target, and slowly additional Desires as the game progresses will enable players to "learn" them as they go, and concentrate on the wacky building aspects. This is a VERY important design concept to grasp, and I've always been a big fan of it. It's probably worth one of my larger design theory posts to talk about, but instead it will just sit here within this one (for now). It is something that Nobleman probably suffers from as well, in a slightly different tone. While there are a lot of rules to learn regarding all of the actions you could take, there is most likely one 2 or 3 that are worth taking, and 2 or 3 that you might as well dismiss altogether. For instance, you might as well not even consider calling a "Masquerade" if you have no Prestige; you are just going to help everybody else. The easiest games to learn are those which start with nothing, and build slowly, adding layers of rules as you go. This, I think, is one of the great barriers of teaching chess to someone new. "Here's 16 pieces, of which, there are 7 types, and they all move differently." It's a trademark of so many games in the modern, especially very complex ones, to allow for teaching as you go. All collectible card games are pretty much driven by this kind of thinking. The entire mass of a CCG of base rules and cards that break the rules, is monstrous; but since cards come into play one at a time, it smooths out the learning curve while actively in the game. It's something I completely missed in my original concept. While building starts small, your TARGETS of what ou are building towards is HUGE. And so, a change is made. Another part of the update will be to vastly simplify the Desire cards down to their required icons, as shown to the left here. To make the game more friendly, I'm switching the scoring rules a little bit. Before, it was an all-or-nothing kind of thing. Whoever got the most of a category on a Desire card won the points, everyone else is out of luck. Now, in my new way of thinking, everyone scores points for meeting a minimum criteria on a card, and the player with the most scores a small to large bonus. Additionally, with some changs in the way the cards come into play (as seen discussed below) and making the individual player scoring variable makes the card play aspect of the game more strategic. While the actual building of Cubes is very much a "multiplayer solitaire" experience, the card play now becomes a push-your-luck kind of thing. There is no swapping of cards anymore. Once a card is played, it's there for the rest of the game. Since cards played into slots that award high single-player bonus points will be valuable, these should be early targets for players. 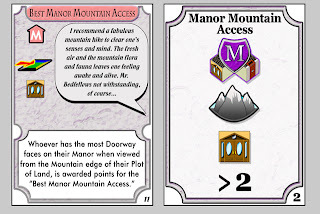 However, bringing them out too early in the game allows for other players to try and build their houses to become the "leader" in that card's requirements. Getting into races with other players, as in most games, usually mucks up the works, as you spend all of your effort in one race that you invariably lose 4 others. So, in theory, the player should wait to play his card when he knows he is in the clear lead that noone will bother to try and "take his card over." However, this creates a problem, as another player can place his own card in high single-player bonus slots before the first player does, so the first player can't wait too long. It's a careful balancing act between trying to capture points without letting other players steal them. The tension between the players racing for card placements, and card requirements, should balance nicely with the solitaire aspect of the house building itself. Speaking of races, I'm in quite of a race myself with Sir Reginald. I'm expecting to enter it into Hippodice this year. Here is where my entry currently stands as I update files, and try to make things generally more understandable. For those who aren't aware, Hippodice is a game club in Germany that runs a fairly well known prototype game contest along with contacts from various publishers. It's the premiere "winner usually gets published" contest in the board game world of geekery. It will be fun to see what happens.